It looks like former UFC welterweight champ Georges St-Pierre is still dodging Nick Diaz. Not really, but I thought that would be a great way to get a few double-takes. 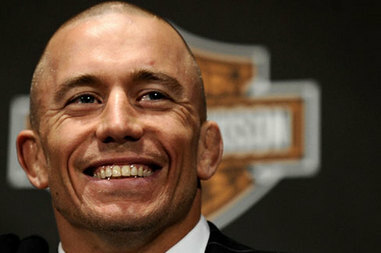 Actually, GSP has blown his ACL in training, sidelining him indefinitely. Since he forfeited his title to take a break, there has been quite a bit of speculation as to when GSP would return to the cage—if ever. The general consensus was that he’d be back sooner rather than later. That certainly won’t be possible now. Here’s the message he posted on Facebook about the injury. Just got confirmation that I tore my left knee ACL during training this week… Surgery in a few days and rehab starts right away. We all face challenges in our lives and I know only one way to take this one: Pain, hard work, no shortcuts and I will soon be back at 100%. Stay tuned and thanks for your amazing support, as always. If you remember, GSP had a similar issue on his other knee at the end of 2011, forcing him from the Nick Diaz bout. Not that it’s a perfect indicator for this injury, but the previous ACL rehab saw him climb back into the cage about 11 months after the incident occurred. In the meantime, it appears the welterweight title is in good hands and the division seems to be as strong as ever. Johny Hendricks earned the belt by defeating Robbie Lawler in a tremendous fight at UFC 171. Let’s hope GSP has a speedy recovery so he can get back in the mix in this exciting division.